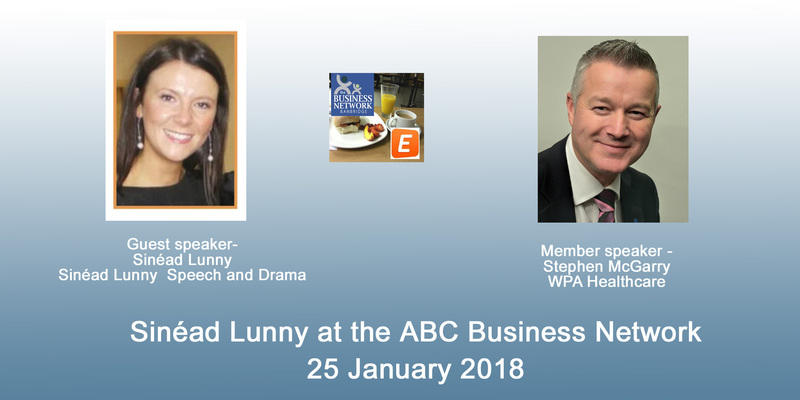 The January meeting of the ABC Business Network will be held in the Conference Room of the Banbridge Enterprise Centre, Scarva Road, Banbridge on Thursday 25th January 2018. Registration is open at 7.30am and the meeting will commence at about 7.45am. The meeting will finish by 9am, and will be followed the Network AGM. Visitors are always welcome and an attendance fee of £7.50 is charged which includes a light breakfast. This is payable when booking on Eventbrite or on arrival if not pre-booked. It is requested that you confirm your attendance by completing the EventBrite registration to enable us to advise the kitchen on numbers for catering. Sinéad Lunny was a lawyer for a number of years before deciding to jack it all in last year when she decided to follow her dream of opening her own Speech and Drama school. Prior to that she had been heavily involved in Speech and Drama throughout her youth. Having spent years pondering and pining for her performance days, she opened ‘Sinéad Lunny Speech and Drama’ in Banbridge and Belfast in March 2017. Sinéad teaches students from 3 years old and is now putting together an adult class focusing on public speaking and presentation skills. She also offers graded exams with New Era Academy and festival participation. Speech and Drama is vital for developing confidence and improving communication and equips students with lifelong skills. Stephen is available to help your business at every stage of your journey with WPA. From finding the policy that best suits your needs, to helping you when you come to make a claim. You can be rest assured that he will help you to choose the right cover at the right price. Stephen is available to help however you choose, be it a meeting, by email or over the telephone and at a time that´s convenient to you. We hope you can join us and benefit from the wealth of experience our speakers can provide, as well as gaining value from the opportunity to network with other members and guests attending.